A leaking natural gas pipeline in Cook Inlet, Alaska won’t be fixed until the ice melts – continuing to flow unchecked into a habitat for endangered beluga whales. Inside Climate News reports that Hilcorp Alaska, the company responsible for the leak, says it won’t be able repair the damage until later this month, at the earliest, due to concerns over safety for its workers. The 8-inch underwater pipeline has been leaking about 120,000 to 310,000 cubic feet of natural gas per day into the ocean since Feb. 7, 2017. “Given the typical weather patterns affecting ice formation and dissipation in Cook Inlet, we currently anticipate that the earliest that the conditions will allow diving will be in mid-to-late March,” wrote Hilcorp Alaska Senior Vice President, David Wilkins. Doing so before that date would likely make it unsafe for the divers who have to head underwater to fix the leak. But it would be appear to be a case of humans vs. whales, as the oil is leaking into a critical habitat for endangered beluga whales. Bob Shavelson, or the Alaska non-profit Cook Inletkeeper, have concerns that methane in the leaking gas could displace oxygen in the water and create hypoxic zones that could be dangerous for the roughly 340 belugas in the area. As Inside Climate News reports, Alaska’s Department of Environment Conservation says Hilcorp didn’t respond to its request for a plan to monitor the leak and environmental impacts. Without such data the state agency can’t assess the threat posed by leak to Cook Inlet. The state has since asked Hilcorp to provide a plan by March 8 – more than a month after the leak began. 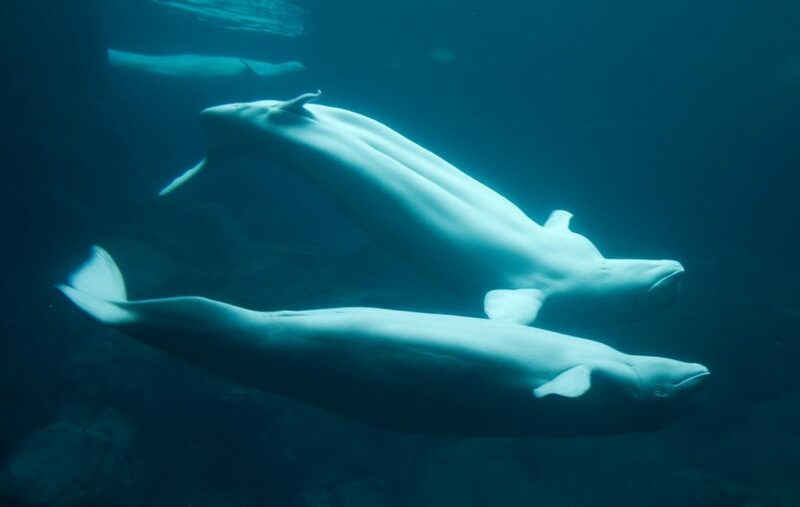 In a letter to Alaska’s DEC, Hilcorp says the amount of dissolved methane coming from the leak is so minimal that it’s not toxic to aquatic organisms, and that belugas tend to avoid areas covered in ice – meaning that there are likely no belugas around the area of the leak. But the National Oceanic and Atmospheric Administration says otherwise. In a recent letter the agency noted that Cook Inlet belugas tend to prefer ice cover, to the point that their presence has become associated with that of ice. Cook Inlet, Alaska - a beluga whale habitat.